Ever heard of Alyvix ? That’s a free environment for monitoring application performance by emulating an end-user interacting with the real application. 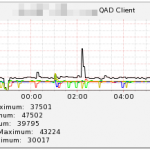 I’ve created a monitoring agent for the QAD/ERP software that allows one to measure the login time as well as the performance of different programs and queries throughout the day from an end-user perspektive. 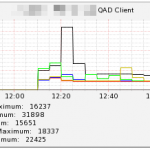 The data can be retrieved from the Monitoring workstation using a REST gateway in order to be displayed within Cacti.